Mango is a fruit-bearing tree grown in subtropical regions around the world. Reaching to 100 feet in nature, cultivated mango trees are controlled through pruning. The fruit of the mango tree is oblong and varies from just a few ounces to over 5 pounds. 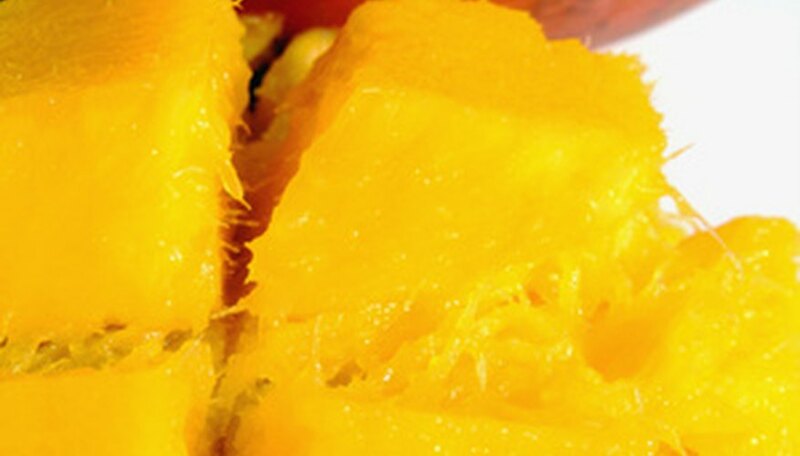 Mangoes have smooth skin and yellow flesh that is very sweet. The University of Florida Extension Service states that mango trees can be grown in the warmest areas of Florida in the southeast or southwest coastal areas, or protected areas south of Merritt Island and along the southern shore of Lake Okeechobee. Plant mango trees from the beginning of early spring to the start of summer, recommends the Florida State Horticultural Society. Mangoes may also be planted in December or January, during mild winters. Purchase healthy and well-developed grafted varieties of mango from a reputable nursery to ensure the plant will bear fruit well. Thoroughly inspect trees to ensure they are free from diseases and pests and are not pot-bound. Plant new trees in sandy, well-draining soil in a location with full sun, away from buildings, other trees or electrical wires. Allow 25 to 30 feet around each tree as mango trees can become large. In areas prone to flooding, plant in mounds 2 to 3 feet high and 4 to 6 feet in diameter. Dig a hole three to four times the size of the root ball. Place the root ball in the hole. Do not add fertilizer or topsoil to the hole. Back fill the hole with excavated soil. Pack the soil firmly around the roots. Water the tree until the soil is damp but not wet. Mulch mango trees with a 2- to 6-inch layer of wood chips, bark, or similar organic material. Water newly planted mango trees every other day for about a week, then one to two times per week for the first few months. Water once a week during dry periods. Trees older than four years generally do not require irrigation. Fertilize young trees during the first year of growth once a month with a 6-6-6 fertilizer with 4 percent magnesium, according to the University of Florida Extension Service. After the first year, three to four applications are sufficient. Harvest mango fruit when firm and mature, usually from May to September. Leave mature fruit on the tree and pick fruit only as needed. As the tree reaches between 10 and 15 feet tall, remove the upper limbs of the tree to limit upward growth and promote lateral growth. Prune the tree seasonally to control its size after harvest.